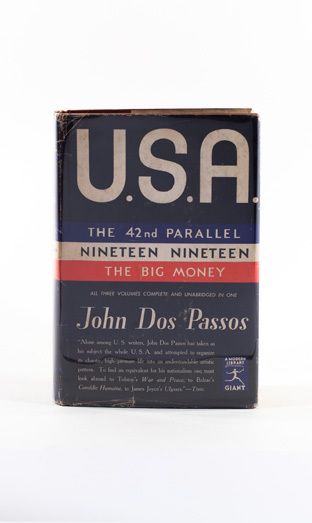 The first volume in what would become Dos Passos’s most famous work, the trilogy U.S.A., The 42nd Parallel introduces grand innovations in the form and content of American literature. The author chronicles the U.S. at the turn of the 20th century, as the country angsts for attention on the world stage. Across America, Dos Passos is troubled by how new institutions and movements—such as industrialization, imperialism, and materialism—stifle human freedom. His satire is born of hope for societal advancement through means consistent with the country’s democratic roots, as he perceives them. He uses a fresh, multimedia style that mixes newsreels, song lyrics, biographies of major figures, semi-autobiographical prose poems, and standard narrative. This collage effect, as well as the accompanying social satire, shakes the literary establishment.